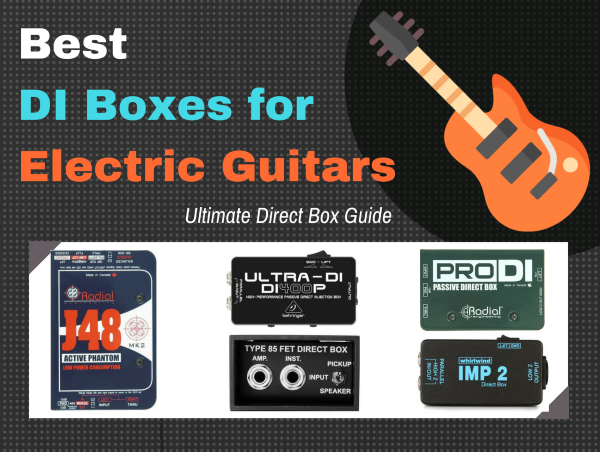 Let’s check out the best DI Box for electric guitar. In a previous post we looked at the ones to use for acoustic. But we can’t leave the electric guitars out of the picture. So we’ve done our research and came up with some top picks for your consideration. Quick answer: Budget buyers, take a look at the Behringer Ultra-DI DI400P. But good value isn’t cheap, so the Radial Pro DI is a great recommend for the industry standard. But if you want true top-of-the-line, the Radial J48 MK2 might be the best choice for you. The rest of this post will take a look at a few other contenders, as well as go into some more details on each of the DI boxes within the context of electronic guitar performances and studio recording. 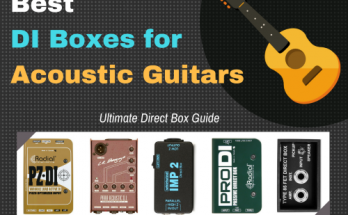 As mention in our DI box guide for acoustic guitars, a DI (“direct input” or “direct injection”) box is an electronic device that is used to plug high-impedance (Wiki link) and unbalanced line level outputs into low-impedance, balanced microphone level inputs. Commonly used in recording studios and sound reinforcement systems, DI boxes generally utilize XLR connectors and XLR cables. DI boxes come in a variety of designs, from barebones, passive units at the lower end of the price scale to sophisticated, active devices with a plethora of features at the other end. These devices are used for a variety of specific tasks and applications, from matching levels and impedance bridging, to reducing noise and distortion, and eliminating ground loops. They are frequently used to plug electric guitars or electric basses into mixing consoles in order to compensate for the low-level signals of these instruments. What features should you look for in a DI box? So when comparing different models, you should determine whether or not you actually need features such as user-selectable pad settings, parallel outputs, phantom power, and the like. If you plan on using your DI box with a variety of instruments and devices, a user-selectable pad switch is a useful feature to have. This will let you switch from 0dB, 20dB, and 40dB settings, enabling your DI to accommodate instruments with varied output levels. Also consider whether or not you want a passive or an active DI. Passive DI boxes do not use batteries or any other power source. Such devices are essentially transformers that simply match impedances and balance levels without doing anything else to the signal. Active DI boxes are battery or phantom-powered devices with preamplifiers that boost the signal and increase impedance. For this reason, they are usually better suited to low-level signals as compared to passive circuits. For this reason they are usually preferred for use with acoustic guitars. Active DIs are also preferred when low noise, hi-fidelity sound, and sonic transparency are essential. This is especially important if you plan on using your DI for live musical performances. With such a crucial piece of equipment, you will want to ensure that it is robust enough to withstand the rigors of the road. For most applications, you could simply have as many single channel devices as you need. If you have a need to frequently plug in several instruments and sound sources however, a multiple channel DI box might be better suited to your purposes. Depending on your needs, you could invest in a dual channel device or a rack unit that accommodates up to eight different sound sources. 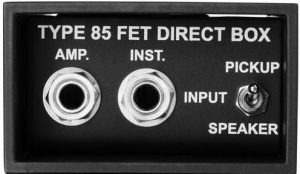 Other useful features to have are a thru/bypass switch that lets you route the incoming signal to a separate output for additional processing or amplification, a ground lift switch that helps reduce or eliminate noise, and a polarity reverse switch that helps prevent feedback and enables you to compensate for wrongly-wired XLR cables. See our more detailed explainer on DI boxes for a better understand of each of these features and how they work. Remember to take a look at the Final Thoughts below for the final analysis. … but which nevertheless deliver outstanding value. 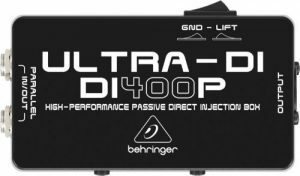 The Behringer Ultra-DI DI400P is no exception, providing pretty impressive performance at low cost for electric guitar recording or live performance. A 1-input/2-output device, this box splits the signal between an unbalanced output for connecting into an amplifier and a balanced out for feeding into a mixer or other line level input device. Simple and easy to use, the DI400P has a ground lift switch that eliminates potential ground loop problems. For the price, the clean and flat signal emitted by the unit is fairly impressive. The overall impression seems to be that the DI400P provides enough functionality to handle basic home and project studio needs, while still being useful for stage applications. The somewhat flimsy construction doesn’t inspire much confidence, although the ability to connect long cable runs without losing high end is a definite bonus at this price. The Behringer Ultra-DI DI400P isn’t going to win any awards for robustness or signal quality. Although the inclusion of a ground lift is a nice touch, the circuitry isn’t as well-shielded as the other DI boxes in this roundup. Some users may therefore find issue with the noise produced by the device, although it is perfectly acceptable for less demanding live and studio applications. 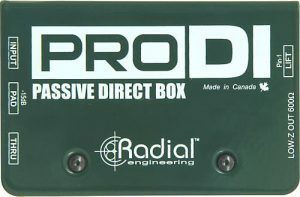 The Radial Pro DI is a standard in studios and sound stages the world over for good reason. Versatile enough for even more demanding applications, its clean and powerful balanced signal makes it an essential addition to any studio engineer’s arsenal. Built to withstand even rugged live use, the Pro DI is a simple and straightforward unit that is remarkably easy-to-use. It doesn’t impart any distortion at all to the signal, and the isolated circuitry and the ground lift switch (Wiki article) help eliminate hum and crackling regardless of the source. The Pro DI’s reputation for clarity and low noise is well known among professionals and hobbyists all over the world. Many DIs are known to impart some sonic character to the audio, but most users attest to the near total absence of artifacts when using the Pro DI. This is a very important point to make note of. Although the Radial Pro DI isn’t the cheapest direct box around, it manages to punch well above its weight class with its solid construction and flawless performance. The MuMETAL shielding is especially effective at preventing electrical noise, and features such as the -15dB switch helps it measure up against more expensive units. 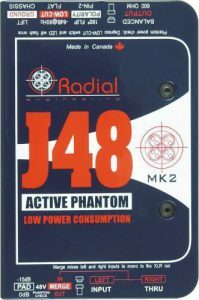 The Radial J48 MK2 is quite possibly the last DI box you will ever need. An active unit that delivers high-quality, transparent sound, it is designed to provide the most headroom possible from a 48V phantom power source. The Mk.2 has a unique switching power supply that allows it to handle peak transients of up to nine volts with no signal degradation whatsoever. In addition to improving dynamic range, this design also reduces harmonic and intermodulation distortion, resulting in more accurate sound reproduction. The Radial J48 Mk.2 is frequently praised for its ability to handle most every sound source or equipment. It is especially popular among guitarists that need a clean and powerful balanced signal to feed into a software or hardware amp simulator. Although there is some debate as to whether or not spending the cost of the Radial J48 Mk.2 is justifiable, the useful features, solid construction, and undeniable transparency make it a serious contender regardless of price. As far as DI boxes go, the J48 is total class all around. Solidly built with a host of features that come in handy for most every recording or live situation, it might just be a worthwhile investment for those that demand total reliability and performance from their DI boxes. Whirlwind is another popular brand among budget-savvy audio mavens, with its IMP 2 model a familiar sight in many studio and sound reinforcement rigs. Providing excellent value for the money for electric guitar players, the IMP 2 is rugged enough to use in live applications, and yet it packs enough features to make it useful for studio use as well. Many of the comments about the IMP 2 attest to its durability and rugged construction. Its sleek and compact form is surprisingly sturdy, due to the rivets used in attaching the individual components to the chassis. In terms of function, the IMP 2 does a great job of reducing hum with its handy ground lift switch. The 133:1 impedance ratio also helps reduce line noise, making this DI a surprisingly versatile device that holds its own even in more demanding applications. 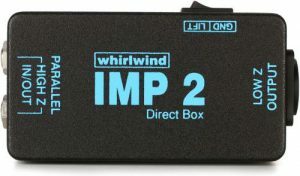 Few DI boxes in this budget range can compare to the performance and durability of the Whirlwind IMP 2. Most every serious user will likely upgrade to a more fully-featured DI at some point, but the IMP 2 will always be useful to have around even as your needs grow. Now this is a noticeable step up from the budget range of DI boxes. The Countryman DT85 Type 85 is another studio and stage mainstay that hobbyists and studio owners recommend over and over. Many electric guitarists refer to this little unit because of its flexibility. It is switchable between line and mic level devices, making it suitable for a wide variety of equipment and audio sources. As could be expected from a DI box in this price range, the construction is pretty rugged, with the extra-thick aluminum casing definitely inspiring user-confidence. Countryman isn’t quite as familiar a brand as others in the audio and recording market. Nevertheless, the Countryman Type 85 has got itself quite a reputation for the solid sound quality, the versatility of the input level controls, and the convenience of phantom power operation. Although some users did balk at having to spend so much for what is essentially a simple and straightforward DI box, most agreed that the DT85 provides superb value for the money. The Countryman Type 85 is a versatile and handy device that scores points for its phantom power operation, selectable line/mic level inputs, and tank-like construction. Sure you could spend a little less and get similar performance and functionality. But the peace of mind that comes from knowing that you can count on a totally reliable DI box certainly justifies the added cost. All options are really great. But if you had to buy one, which would it be? If your needs are fairly simple and you don’t want to spend too much on a DI, the Behringer Ultra-DI DI400P and the Whirlwind IMP 2 will certainly fit the bill. They’re sufficiently reliable with enough features and capabilities to handle most every basic to intermediate need, either of the two should tide you over until you can spend for a more feature-packed and robust unit. Somewhere in the middle are the Radial Pro DI and the Countryman Type 85. Although just barely scraping past the upper limit of the budget range, these rough-and-ready units can proudly stand up to DI boxes that cost up to a hundred dollars more. However, if you are looking for a top-of-the-line DI box right now, and you don’t mind spending a bit more for reliability and performance, the Radial J48 MK2 should be at the top of your list. With its versatility, crystal clear sound reproduction, and professional-class features, this is one DI that you won’t outgrow for a long time to come.